Register your details prices unlock once your business is approved. An email will be sent to you to confirm your username (email address) and password are active. Once your username is active, you can purchase online or via email or phone. 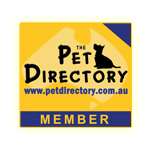 All clients are welcome to visit our pet Trade Only warehouse in Boronia Victoria. Please give us a call on (03) 9729 9700 to arrange a time to visit. We apologise for those wishing to purchase on a retail basis, we are "trade only" wholesalers to the pet industry. If you are a pet owner wishing to buy one of our unique pet products we can put you in touch with a distributor near you.